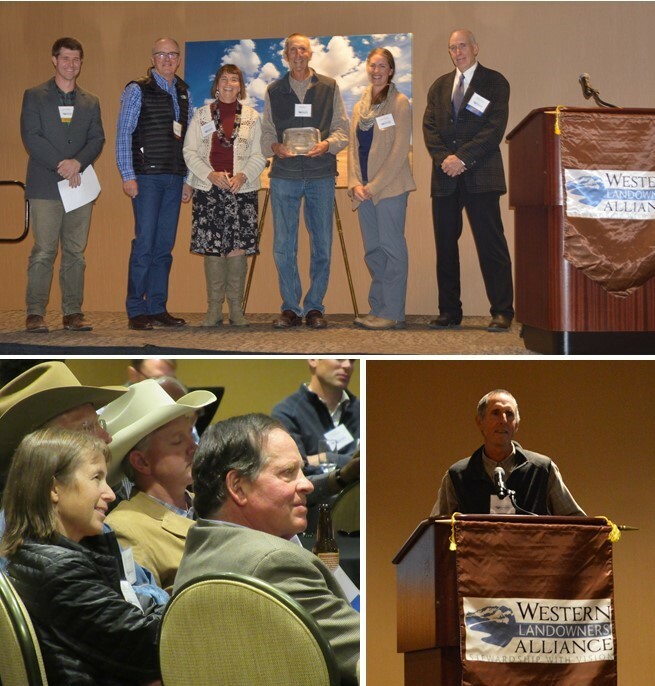 Western Landowners Alliance was delighted to publicly recognize Montana resident Bill Milton with the first annual “Lands and Livelihoods Award” for his exceptional contributions to the stewardship and conservation of working lands throughout Montana. The award was created to recognize an owner or manager of working lands who has made exceptional contributions as a citizen in sustaining working lands, connected landscapes and native species. The award is given to recognize exceptional vision in helping to create, as Wallace Stegner once said, “a society to match the scenery.” Alternatively, the award could also be awarded to an exemplary partner in working lands stewardship identified from within a government agency, an NGO or the private sector. Before a crowd consisting largely of leaders in agriculture and conservation last night, WLA Associate Director Cole Mannix praised Milton for his lifelong commitment to caring for land and community. Over the last 40 years, Milton has worked with a number of organizations. He was a founding board member of the Montana Land Reliance and continues to participate in—and sometimes facilitate—many working groups in central Montana, including the Musselshell Watershed Coalition, the Winnet ACES, the CMR Community Working Group, and the Musselshell Valley Community Foundation. Milton has a particular interest in helping ranchers and local communities figure out how to monitor the health of the working landscapes and communities. As a special honor for the inaugural award, the National Geographic Society has donated $10,000 to be used to designate a place-based collaborative effort of Milton’s choosing. Upon the announcement of the award it was revealed that Milton had selected the Ranchers Stewardship Alliance, a Montana-based 501(c)3 striving to feed the world, preserve prairie neighborhood and nurture the next generation, together with Winnett ACES (Agricultural and Community Enhancement and Sustainability), a group of cattle producers from the tiny community of Winnett, Montana, working for the people, the livestock and the land for which they are responsible. Click here to view photos of Bill Milton’s work.